The Grand Junction Visitor Center is the ideal place to ask questions, receive travel trip guidance, and pick up brochures on everything from dining and lodging to area attractions. However, it’s more than that. In addition to interactive displays on their own city, visitors will see ones on those in nearby towns such as Fruita and Palisade. These include Dinosaur Journey, Colorado National Monument, and the wineries. All of these exhibits are very well done and should pique your interest about visiting these sites. The visitor center is located at 740 Horizon Drive in Grand Junction. Its telephone number is (970) 256-4060. Hours are daily 9:00 a.m. to 6:00 p.m. For more information on the area, go to their web site. If you want to try wonderful candies, head for Enstrom Candies. The company was started when Chet Enstrom and his wife, Vernie, launched with their partner Harry Jones, the Jones-Enstrom Ice Cream Company in 1929. It was a business Chet pursued for 30 years. By 1960, his almond toffee had achieved quite a reputation. At the urging of early gift recipients, Chet founded Enstrom Candies. Although Vernie and Chet had wanted to make it a mom-and-pop operation, they found that they couldn’t because of the large amount of orders they received. By 1965, the company was shipping worldwide. Chet sold the business to his son and daughter-in-law, Emil and Mary Enstrom, so he could become active in Colorado politics. In 1979, Emil and Mary’s daughter Jamee and her husband, Doug, purchased the business and continued building the company. Their sons, Doug Jr. and Jim, have now joined Jamee and Doug. Ensrom Candies has expanded its product lines to include popcorn, truffles, and gourmet chocolates including sugar free ones. Gourmet chocolates come in caramels, truffles, nuts and chews, mini-turtles, and peppermint cookie bars. Although their product is expensive, $23.95 a pound, we learned how to save money when we visited their main store which is located downtown at 701 Colorado Avenue. It’s a large facility with an excellent assortment to select from. We were able to pick up a good-sized bag of sugar free mixed-nut covered chocolates, including dark and white, for $5. These candies were superb. You can order their products on line or you can visit one of their retail outlets. The one on Colorado Avenue’s hours are 7:00 a.m. to 8:00 p.m. Monday through Friday, 8:00 a.m. to 8:00 p.m. on Saturday, and 10:00 a.m. to 4:00 p.m. on Sunday. Their telephone number is (970) 683-1000. A second store is in Grand Junction with others at Arvada, Denver, and Fruita. To order on line or check out their products, visit their web site. Although the Grand Junction Art Center is small, only four galleries, its programming and mission are not. Its mission is to improve the quality of life in the community by promoting the enjoyment and understanding of the arts. This is done through having more than 27 to 28 art exhibits annually; by preserving a permanent collection; providing lectures, classes, and workshops for those of all abilities and ages; and supplying day camps. Founded by a group of artists in 1953, the Art Center will celebrate its 65th birthday in 2018. It is a non profit organization with only two to three percent of their funds received from the government. Exhibits display the works of everyone from the local high school students to artists who are nationally and internationally known. When we visited in late May, two exhibits were taking place. 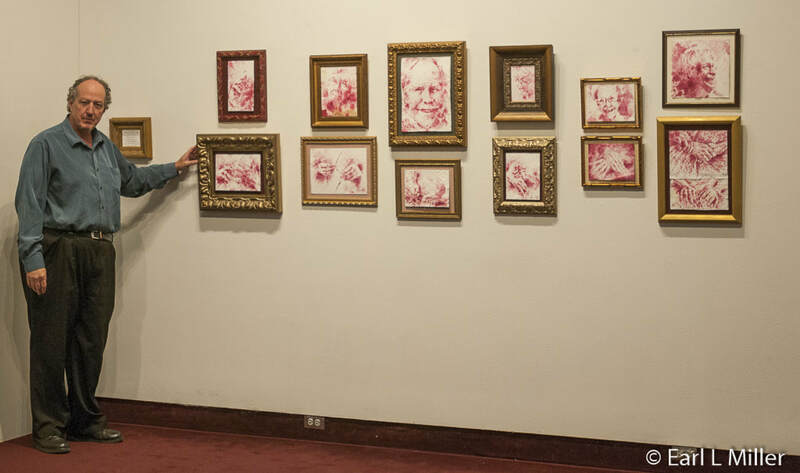 One was a juried show of artists from 23 cities in 12 states titled “Contemporary 2017: Retellings.” Its directive had been to use traditional materials and processes to relate narratives in new ways. Each work had to encourage histories, memories, or media that might have been forgotten or ignored at one point and retold now. The other show was called “Pure Pigment” and was strictly the medium of pastels. It was presented by the Pastel Society of Colorado. Both shows took place until June 24. Although the museum has a collection of permanent art, including 300 paintings, there is no current room to display this work. Director Lee Borden advised that he would like to build a new facility with room for a permanent gallery. 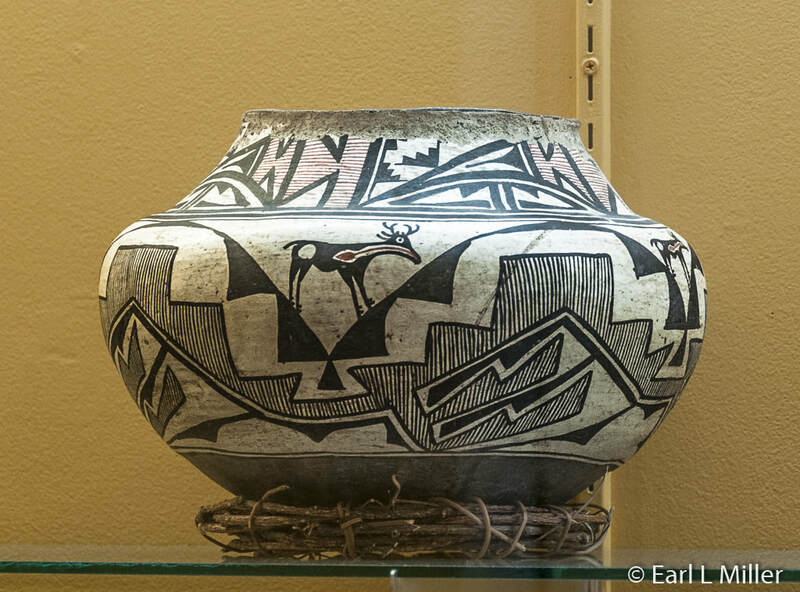 They do have in cases in the hall of 40 North American pieces that are mostly Ancient Puebloan. These were donated by Philip and Gail Holstein. 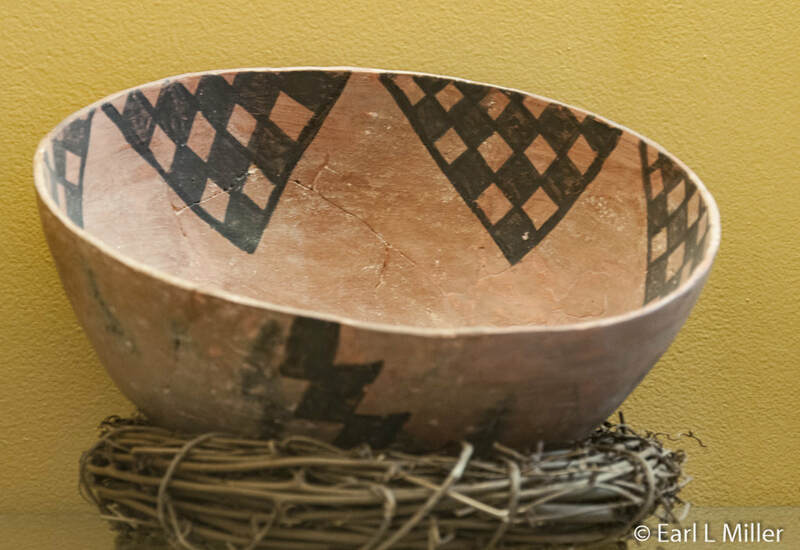 One piece of pottery they are particularly proud of is the piece by Maria Martinez, known in New Mexico for her work from the 1920's to the 1940's. Other prized possessions are their large collection of Navajo woven rugs collected by Dr. Arch Gould. Others have been added since. They have 20 to 30 of Harold Bryant’s paintings. His works are like Charles Russell’s as they are scenes of cowboys. Bryant did most of his paintings in the 1920's and 1930's. The contemporary portion of their collection includes works by Colorado artists. The art center used to have a theater component until ten years ago. With a background in theater and radio, Lee is hoping the Center will do Shakespeare in the Park this fall. They are also planning a dance concert with some of the city’s finest dancers and choreographers involved. The Center does a variety of classes for children, special needs persons, and adults. 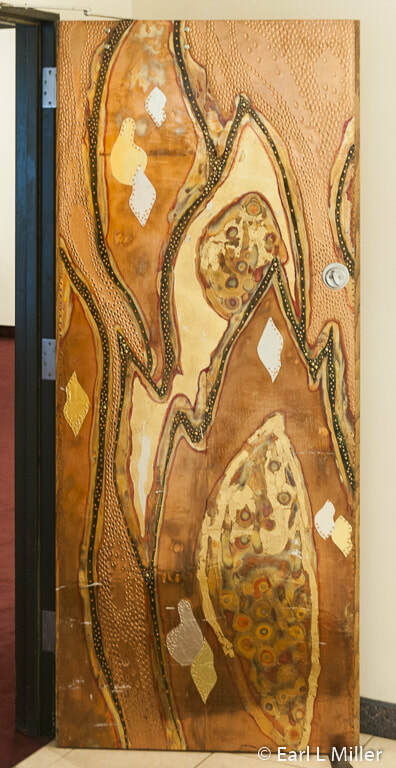 These range from beginning to master classes in ceramics, painting, sculpting, fibers, and even paper collage. Hundreds of youngsters and adults take these every year. The center finds some parents, who attended some 30 years ago, now have their children take classes. Week long summer camps for ages five to twelve are provided on a variety of subjects. Four five-day teen workshops were also given in 2017: Figure Drawing, Cartoon and Manga, Fashion Design and Industry, and Open Studio allows teens to work in the medium of their choice while being mentored by a professional artist. On the first Friday of the month, at 6:30, an artist introduction and reception take place with free hors d’oeuvres and a cash bar (beer and wine). These events are free and open to the public. The Art Center is located at 1803 N 7th Street in Grand Junction. Its phone number is (970) 243-7337. Tuesday through Saturday, the museum is open 9:00 a.m. to 4:00 p.m. It is closed on Mondays and Sundays. Admission is free for all on Tuesdays. On Wednesdays through Saturdays, admission is $3 for those over age 12 and free to those younger than that. A small gift shop can be found at the Center. Currently housed in the same building as New Emerson Elementary School, the John McConnell Math and Science Center’s role is to advance math and science education. Its purpose is to make sure youngsters have the knowledge and skills to solve problems, gather and evaluate evidence, and make sense of the data they obtain. The center realizes that children gain these skills by studying science, technology, engineering, and math - known as STEM education. The Center has inspired students for more than 25 years. It was started by physicist John McConnell who had a career for 30 years at the U.S. Department of Energy’s Ames Laboratory and Los Alamos National Laboratories. He retired to Grand Junction in 1990 and began working with the Odyssey of the Mind Team at an elementary school near his home. When teachers began asking him for help, he devoted time and energy to small student groups. When the program outgrew his traveling to the various schools, the school board gave John a permanent home for his program. 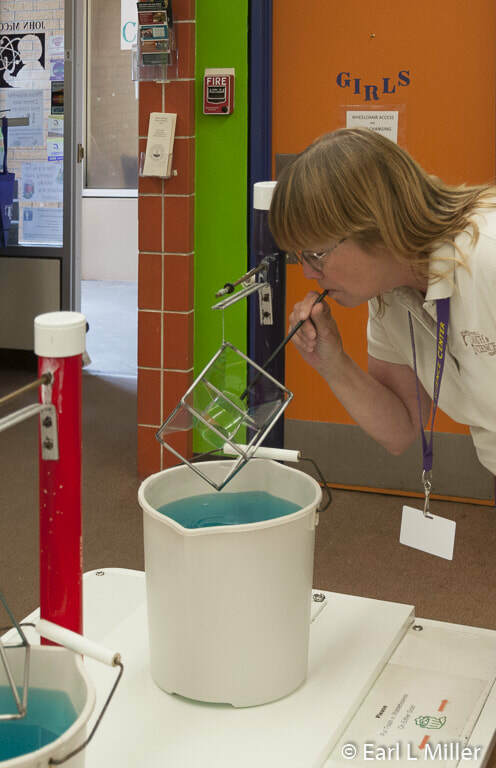 The Western Colorado Math & Science Center at Wingate Elementary School was developed. In 2011, it moved to its present home at New Emerson Elementary School where it was renamed in honor of John McConnell. Today the Center integrates teaching and hands-on experiences in a STEM learning environment with the goal of creating a passion and respect for math and science. Other objectives are to develop and provide classroom resources, train educators, and develop STEM programs that are innovative. The center, a non profit, works closely with the school district’s curriculum director and receives funding from the district via a grant. Since 2012, the Center has created and distributed elementary science resource kits for every science unit taught from kindergarten through grade five. With four to five lessons in a box, they consist of activities and resources as well as a lesson plan. Each grade’s kits are revised and updated annually. More than 10,000 students and their teachers in 25 elementary schools have benefitted from them. 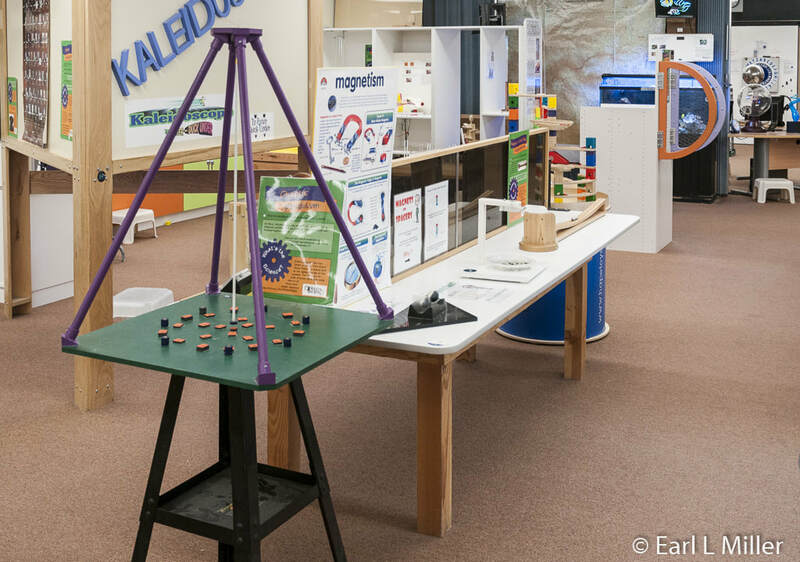 Visitors to the Center, whether they are adults or children, enjoy more than 150 interactive experiments. More than 15,000 youngsters have been involved in math and science education through the Center. 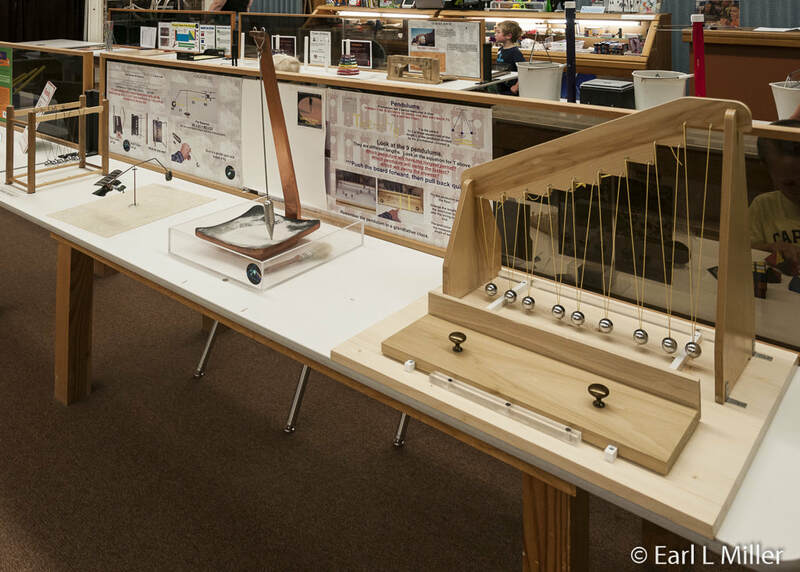 In 2015, students and adults from 75 Colorado cities and towns and 31 states explored the exhibit hall. Class field trips brought in another 7,000 students. 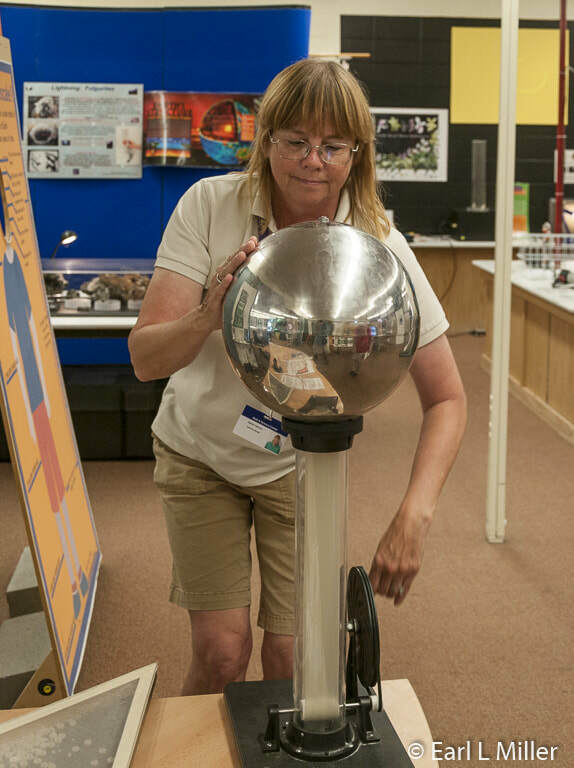 Staff and volunteers taught science lessons to 4,000 students in classrooms, fairs, and various special events across Western Colorado. In addition, the Center held after school classes and summer camps. Walking around the room in which the exhibits are seen, it’s difficult to know which experiment to try first. John McConnell, who is in his 80's, constantly designs new ones for the Center. One popular display is the casting of colored shadows: blue, red, and yellow. This is done by standing in front of a wall and creating shadows. The Van de Graaf generator creates static electricity. Another is titled Augmented Reality. 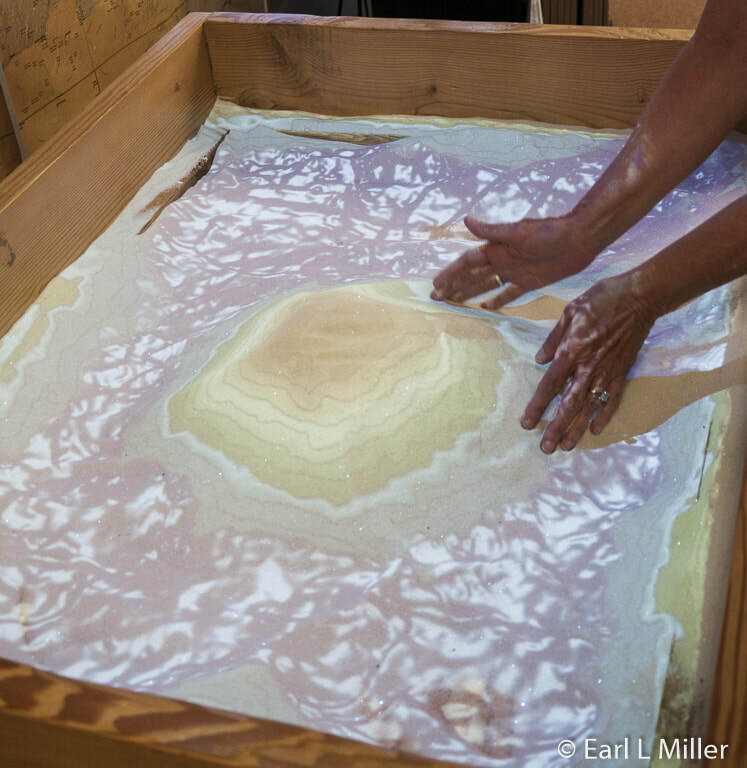 In a sandbox, students can design topographic maps. They can build a mountain. As the top changes elevation, lines in the sand change from one color to another. They’ll also learn about erosion and watersheds as they move entire mountains, dig valleys, and create virtual rainstorms. All ages seem to enjoy watching the beehive. A tunnel to the building’s exterior allows the bees to enter or exit. 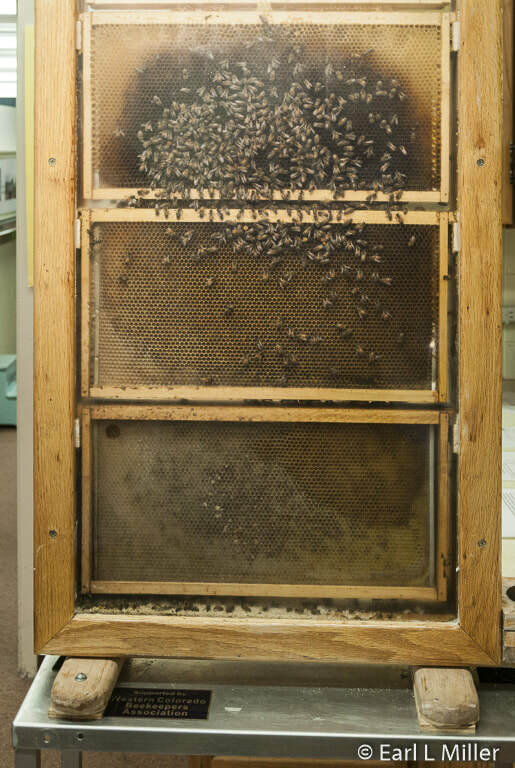 There is signage about the bees so people can learn about the roles of the queen and her workers, how honey is made, and about the care of larvae. 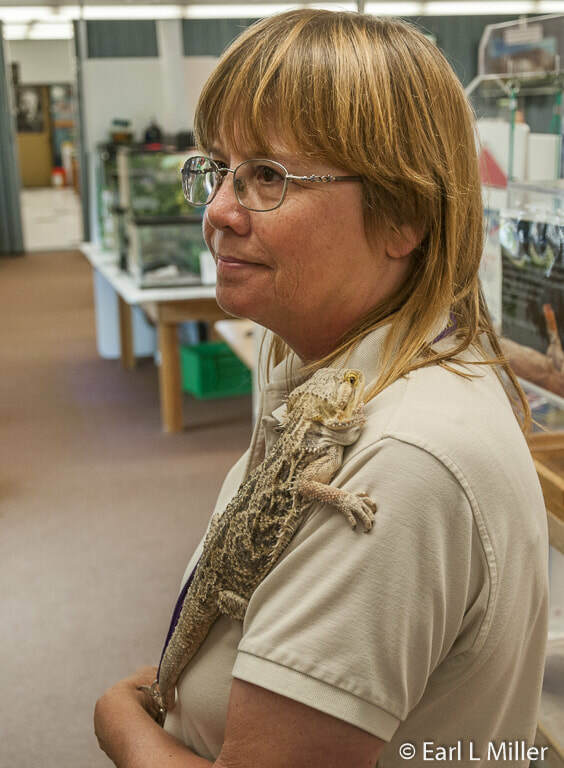 Youngsters also enjoy seeing the Ball python named Monte and the museum’s mascot, a Bearded dragon named Draco. There are small fresh and salt water fish tanks. The cactus garden is operated by a local cactus group. The Eye of the Camera teaches how lenses work and about inverted images. Earl enjoyed playing with Bubbles, an activity always in the top three of the most popular. By blowing in the center of a form, the bubbles take the shape of a form such as a triangle. They have found using Dawn liquid soap creates great bubbles and adding solid vegetable glycerin sustains them. The program will be moving in January 2018 to the new 60,000 square foot engineering building at Colorado Mesa University, which is located at 7th Avenue and Kennedy in Grand Junction. $5.5 million dollars are being raised for the new Center now. Currently, 22 engineering students are at work designing new displays. The Center will have approximately 13,000 square feet on the first floor of this building. The space will be dedicated to exhibits and experiments; classrooms and a workshop; and storage, meeting, and administrative space. This will allow housing for more exhibits. Emphasis will change from its current focus on elementary school youngsters to an expanded program of educational activities for all ages, whether they are K-12 students, university students, or adults. District 51 Elementary Science Curriculum and Resource Kits will be improved and updated. More informal education through after-school programs, camps, community events, seminars and outreach programs will take place. In the new building, the size of the gift shop will increase. It is currently quite small. The current admission is $12 for families and $4 for individuals. These prices will increase, but it has not been determined what they will be. Now visitors can come Monday through Saturday from 10:00 a.m. to 5:00 p.m. The new center will also be open on Sundays. The current address is 2660 Unaweep Ave in Grand Junction Colorado and their telephone number is ( 970) 254-1626. For those who want to join the free notification list on NanMillerTimes.com for new articles, go to the Contact Page. Don't forget to put your city and state. We like to know where our readers are from. Emails are never given out. 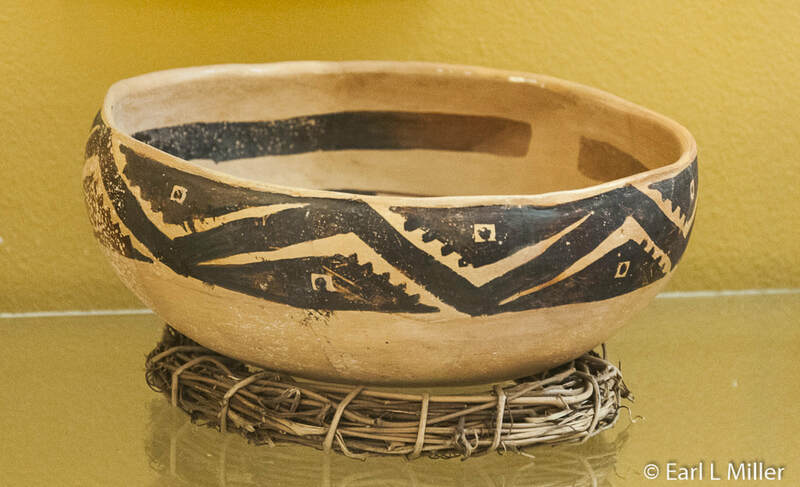 Jeddito Black on Yellow Bowl - Circa 1325-1600 A.D.